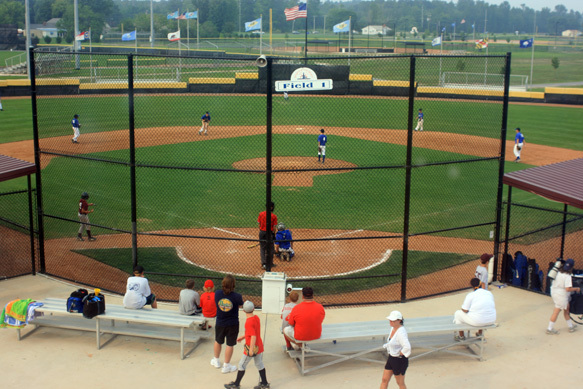 When I was a kid, youth baseball leagues ran only in the spring; nowadays, they're practically year round for travel teams - and a huge time commitment for the kids on those teams and their parents. So it was with some trepidation that we let our 8-year-old try out for one of the travel squads in South Jersey last summer. He made the team and, along with a dozen-plus other kids, finished up a successful season last month. Since the team entered the tournament late, there weren't too many accommodations left by the time we booked a stay. We opted for the clean and comfortable Atlantis Inn, two blocks from the beach. After we checked in, we joined the crowds strolling on Rehoboth Avenue and went looking for a sweet treat. The Ice Cream Store fit the bill, with more than 70 (70!) flavors - from the traditional vanilla and chocolate to the more outlandish like Booger and Motor Oil. The store doesn't have a gluten-free list, but staffers were willing to pull out containers so that I could look at the ingredient labels. On the other hand, the help at the Candy Kitchen location next door wasn't so accommodating. They kept no list and couldn't be bothered to check on any ingredients. Saturday morning, we joined another teammate's family for breakfast at the Robin Hood Restaurant on Rehoboth Avenue, where the chef was able to prepare for our older son a mushroom, pepper and onion omelet with a side of potatoes. The young lad apparently wasn't full, because he then picked up a gluten-free chocolate cupcake with vanilla cream cheese frosting from Cake Break around the corner. Owner Debbie Katz always has several gluten-free options on hand. Back in Rehoboth, many of the teammates and their families met up for dinner at The Greene Turtle on the Boardwalk. Our older son ordered a ribs-and-chicken platter from the gluten-free menu. Tempted to go back to sample more flavors from The Ice Cream Store for dessert, we instead got vanilla custard from the Kohr Brothers stand on the other side of Rehoboth Avenue. With the two wins, the team earned a bye in the Sunday morning quarterfinals so my wife and younger son slept in while our older one and I went out to breakfast. We walked over to Hobos on Baltimore Avenue, which came highly recommended for gluten-free diners, but it wasn't yet open for brunch. We ended up by happy accident at The Gallery Espresso, where my son devoured an order of gluten-free French toast. Of course, his breakfast wouldn't have been complete without a Cake Break chocolate cake pop. We reunited in the early afternoon, searching for potential bargains at the Rehoboth-area outlet stores, and broke for lunch at Bethany Blues BBQ in Lewes. (A second location is in Bethany Beach.) Since all of the 'cue sauces are gluten free, my older son relished the beef brisket on a Schar roll we brought from home. After a slow start, our younger son's team cruised past another Delaware squad in the semis, 14-5, setting up a championship showdown with a rival New Jersey team. Having watched our son's squad get thrashed by the other team in another tournament weeks earlier, we knew this would be a challenge. Indeed, the opposition went up big early on but our kids mounted a late rally. While they lost the finale, 12-7, the boys gave themselves and their families many reasons to be proud of how they played and bonded over the weekend. I'm no where near Philly, but will definitely but these places down as places to go.